Fears of an industry slowdown drove down shares of the chipmaker last month. 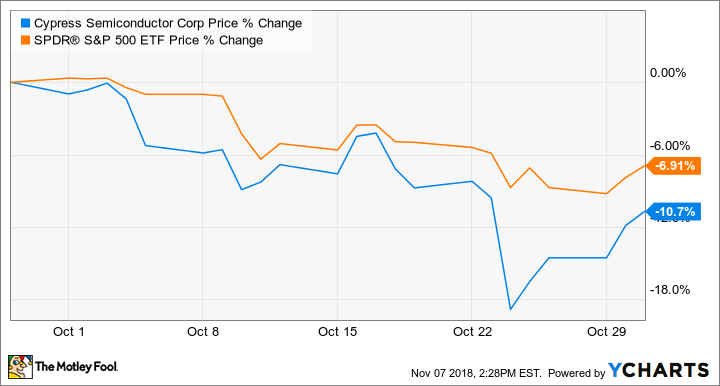 Shares of Cypress Semiconductor (NASDAQ:CY) declined 10.7% in October, according to data provided by S&P Global Market Intelligence. For context, the S&P 500 lost 6.91% in value. Cypress stock sold off sharply in the last week of October following a weak outlook given by top chipmaker Texas Instruments (NASDAQ:TXN). However, a solid third-quarter report from Cypress toward the end of the month assured investors that near-term demand for the company's products is still strong. Cypress beat analysts' expectations in the third quarter, with revenue up 11.3% year over year to $673 million. Analysts had been expecting third-quarter revenue of $670 million. Non-GAAP earnings per share increased a whopping 48% to $0.40 per share, compared to analysts' expectations of $0.38. CEO Hassane El-Khoury said, "Our strategy and investments to advance our portfolio of highly differentiated connect, compute and store solutions are paying off." He added, "We are seeing a strong design pipeline leading into the fourth quarter with design activity increasing 23% year-over-year." Also encouraging was news that Cypress entered into a joint venture with SK Hynix, which will allow Cypress to exit a very cyclical NAND memory chip business to focus more on higher-growth markets like automotive, industrial, and Internet of Things. Speaking about the financial impact of the joint venture, El-Khoury said, "While this transaction will negatively impact our near-term [earnings per share], it will be accretive to Cypress' revenue growth, gross margin and cash flow in the long run." Management did cite some softness they are seeing in the fourth quarter relating to tariffs and other economic concerns, which El-Khoury said is "causing disruptions" for some of Cypress' customers across key markets. Nonetheless, management still expects to meet full-year revenue growth of 7% over 2017. Their long-term goal is to maintain current profitability levels of greater than 20% operating margin through all industry cycles. Analysts expect Cypress to report full-year non-GAAP earnings per share of $1.33, compared to $0.89 in 2017.